to clea﻿n air, pure water, and to the preservation of natural, scenic, historic, and esthetic values of the environment. Is Pennsylvania's Supreme Court Being Ignored? ​January 2, 2018: Without hesitation, PEDF attorney John Childe is at it again, asking the state's highest court for help again today in fighting to conserve Pennsylvania's public forest and park lands. PEDF obtained a landmark ruling from the Pennsylvania Supreme Court six months ago. 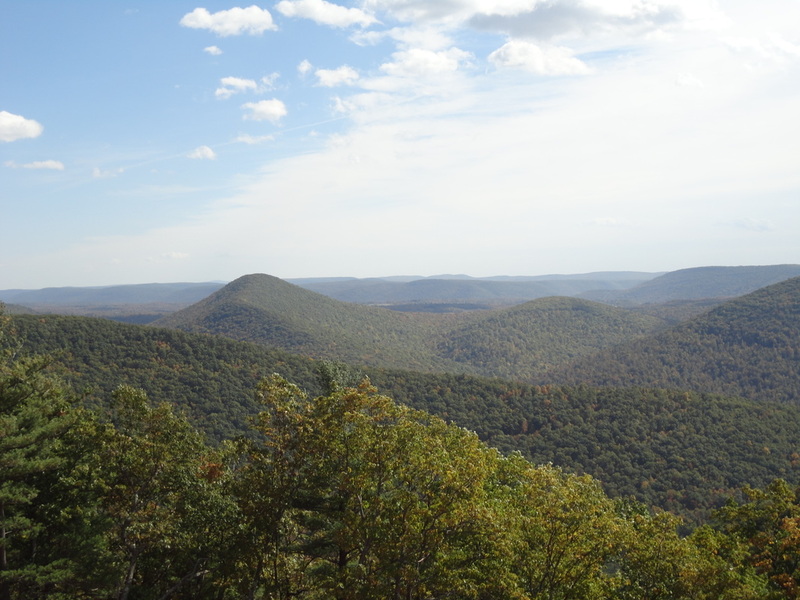 The court declared that money from the sale of natural resources such as natural gas on Pennsylvania’s public forest and park lands cannot be used to fill gaps in the state budget. PEDF has today filed with the Supreme Court a Petition for Extraordinary Jurisdiction. After its landmark ruling in June, the high court returned the case to the Commonwealth Court with direction to address the issues raised by PEDF consistent with the high court’s ruling. The Commonwealth Court has not taken any action to date, and the latest budget, which was finalized after the high court’s ruling, spends at least $96 million from the sale of public natural resources to pay general government expenses for the current budget year. Under Pennsylvania’s constitution, public forest and park lands are part of a public trust owned by the people of Pennsylvania. The government must protect the natural resources of this public trust and cannot sell them to balance the budget, as it has done since 2009. Yet the budget just finalized for this fiscal year continues this trend. To date, more than $1.1 billion from the sale of public natural resources has been used to fill gaps in the state budget. PEDF argues in its filing that without the high court’s oversight, the government will not heed its ruling and will continue to degrade public forest and park natural resources to balance the budget. New budget negotiations for the upcoming fiscal year begin in February. Are Governor Wolf and the General Assembly ​above the law? Forty-seven years ago, the people of Pennsylvania voted four to one in favor of clean air and pure water and all that Article I § 27 of our State Constitution stands for. We needed it then. We need it even more now. Please help! Click here. Filing: Part of 2017 State Budget Unconstitutional!? July 5, 2017: Today, PEDF attorney John Childe filed an application in Commonwealth Court for declaration that part of the 2017 Appropriations Act is unconstitutional and invalid per the June 20, 2017 Supreme Court ruling. To read the Application, click here or go to Current Litigation. SAVED BY THE SUPREME COURT! A Really, Really Big Deal! What Does the Supreme Court Opinion Really Mean? Pennsylvania’s State Forests and Parks were in dire trouble in 2011, and the PEDF knew it. The Marcellus Shale gas industry had already wrought enormous and irreparable destructive changes in the State Forest, and there was much more to come. Entrusted to “all the people” . . . “for generations yet to come” by the Environmental Amendment of the State Constitution (Article I, § 27), the resources, values and integrity of the people’s lands were in imminent danger of being lost for all time when the unconventional gas industry came knocking. So, as they had done since 1986 when environmental rights action needed to be taken . . . and with an all-volunteer organization and very limited resources, the PEDF board called upon their attorney, John Childe . . . and jumped into the abyss. he persevered through petitions, objections, denial, arguments, reargument, and more. It seemed like PEDF v. Goliath. But Childe was up to it. he came through with A REALLY, REALLY BIG DEAL! To read in Childe’s words how and why this all happened, please click here. To read about current and critical follow up to this landmark decision, please go to Current Litigation. For Childe’s summary of the Supreme Court Findings, please keep reading below. and PEDF still needs your help! Nearly all contributions fund our litigation. 1. The standard for review of challenges of government actions under Article I § 27 is the text of the amendment itself as well as the underlying principles of Pennsylvania trust law in effect at the time of the enactment. 2. The Payne v. Kassab three-prong test of the Commonwealth Court to determine compliance of government actions with Article I § 27 has been overturned, thus eliminating forty-three years of precedent, and opening the door to significant changes on how environmental laws are enforced and permits are issued. 3. The second sentence of the Environmental Amendment establishes that the people own the public natural resources, not the Commonwealth. 4. The third sentence of the Environmental Amendment establishes a public trust. 5. The terms “trust” and “trustee” carry their legal implications, their fiduciary duties. 6. All agencies of the Commonwealth, both statewide and local, have a fiduciary duty to act toward the corpus of the trust, the public natural resources, with prudence, loyalty and impartiality. 7. The Commonwealth may not act as proprietor of our resources, only as trustee. 8. The standard for determining compliance is based on the plain meaning of “conserve and maintain,” which implicates a duty to prevent and remedy the degradation, diminution or depletion of our natural resources. 9. This duty is an affirmative duty to prohibit the degradation, etc. 10. The trustee must also act affirmatively to pass such laws as will best preserve the subject of the trust, and secure its beneficial use in the future to the people of the state. 11. Proceeds from the sale of natural gas and oil are part of the corpus of the trust and must remain part of the trust. 12. The Supreme Court wants the Commonwealth Court to determine if lease and bonus payments are also assets of the trust. 13. Sections 1602 and 1603 of the Fiscal Code are unconstitutional. Victory for Pennsylvania's Public Lands! June 20, 2017: In a historic, landmark decision issued today, Pennsylvania's Supreme Court ruled in favor of PEDF's lawsuit to uphold the Environmental Amendment (Article I Section 27) and the role of state government as trustee of the state's public lands and natural resources. In a majority Opinion (please click on the blue link to read the document), the Supreme Court solidified a broad interpretation of the Amendment, reversing a narrower 2015 interpretation by the Commonwealth Court. The beneficiaries of this ruling, for "generations yet to come," are the people of Pennsylvania, YOU. A heartfelt ​THANK YOU to everyone who supported PEDF in this endeavor! You made it possible! But there is more work yet to be done. We will be posting updates, and we still need your help! ​"The PEDF is grateful that, after 45 years since enactment, the Supreme Court has finally adopted Article I Section 27 as a viable trust for our public natural resources. The Court has mandated that the Commonwealth must manage and protect our public natural resources under strict compliance with the fiduciary requirements as a trustee. No longer can the Commonwealth treat our public resources as government property. Our resources are our property, and the government must protect them for us and for all our future generations. The Court has further recognized that money from the conversion of those resources must be used for the benefit of those resources. This should stop our legislature from requiring leasing of our State Forest and Parks for revenue. The opinion is clear and far reaching. But there are many issues left open to further interpretation. There is still much work to be done in our courts to provide the protection of our resources from further government incursion." Gabby Brown, Sierra Club: "In Victory for Pennsylvanians, State Supreme Court Rules Leasing Public Land for Fracking Betrayed Government's Constitutional Duties," click here. Ellen Gilmer & Mike Lee, E&E News: "Landmark Marcellus Shale Ruling Favors Enviros in Clash with State," click here. Laura Legere & Don Hopey, Pittsburgh Post-Gazette: "Pa. Supreme Court Rules State Forest Gas Royalty Transfers Unconstitutional," click here. Mark Levy, Associated Press: "Environmentalists Win in Court over Gas Drilling in Forests," click here. Susan Phillips, StateImpact Pennsylvania: "Pa. Supreme Court Upholds Broad Interpretation of Environmental Rights Amendment," click here. Public News Service: "Court Ruling Called Victory for Environmental Rights," click here. John Hurdle, State Impact Pennsylvania: "Pa. Supreme Court's Landmark Environmental Ruling Faces First Test," click here. Will the clear and plain language of Pennsylvania's Environmental Amendment stand? Will the people's rights as guaranteed by Article I § 27 be held inviolate? What is the meaning and substance of our Public Trust? of six Pennsylvania Supreme Court justices. addressed every objection and "what if" from the Court. ​Please see links below, particularly the one to PCNTV video, while it is still on the web. Click on the photo of Justice Max Baer and scroll to 1:44:00 for PEDF. PEDF Goes to the Supreme Court! 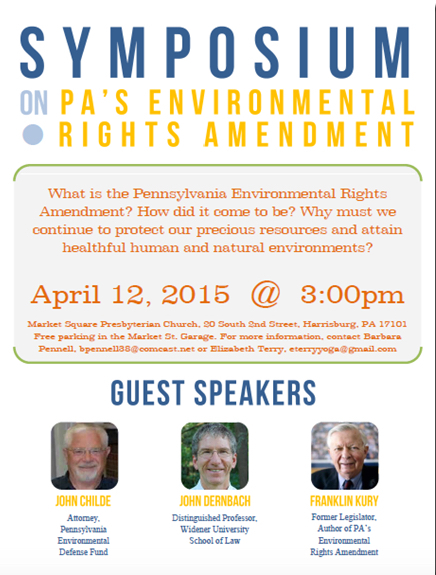 as guaranteed in Pennsylvania's Environmental Rights Amendment to the State Constitution. Pennsylvania Supreme Court, 4th Floor, City Hall, Philadelphia. On Houselander Mountain, Tiadaghton State Forest, one of many roads now closed to public travel, in a once wild and healthy forest that has become a patchwork of rural hardpack and industry. January 22, 2016: Following a comprehensive review of DCNR Bureau of Forestry's Draft 2015 ​​​​State Forest Resource Management Plan (SFRMP), PEDF attorney John E. Childe submitted PEDF Comments, endorsed by Keystone Trails Association, Loyalsock Creek Watershed Association, Lycoming Audubon Society, Lycoming Creek Watershed Association, Pennsylvania Forest Coalition, Pine Creek Headwaters Protection Group, Pine Creek Watershed Council, Pine Creek Preservation Association, and Responsible Drilling Alliance. To click on links to the SFRMP and Comments, to read a Synopsis of the Comments, or to find out how to submit comments by January 31, 2016, please go to State Forest Resource Management Plan Tab under SOS Forests & Parks! Tab. March 9, 2016: PEDF attorney John E. Childe is scheduled to present Oral Argument in Philadelphia before Pennsylvania's Supreme Court in PEDF's landmark lawsuit to affirm meaning to Article I § 27 (the public trust amendment) and save our State Forests and Parks from the harmful effects of unconventional gas drilling. The Supreme Court has agreed to hear all aspects of PEDF's case, including challenges under the Environmental Rights Amendment and transfers from the Oil and Gas Lease Fund to the General Fund. More details will be posted as they are made known. To read the Supreme Court Order, please click here. To read Laura Legere's article on the Order, please click here. Whose woods these are we believe we know . . .
and have asked Pennsylvania's Supreme Court to affirm. In PEDF's latest action, attorney John Childe has filed a Reply Brief to the Governor's and the Republican Caucuses' and General Assembly's Joint Brief in Opposition to PEDF's Appeal to the Supreme Court. ​For highlights of the Reply Brief, please go to Current Litigation Tab. PEDF is now waiting for the Supreme Court. We need your help in seeing this case through to resolution! Our State Forests and Parks have never been more at risk. It doesn't seem possible that anyone could do this to a once wild forest and a mountain and be able to sleep at night. these funds rightfully belong under the Oil and Gas Lease Fund Act for the conservation of our State lands only twists the dagger deeper. Tragically, it isn't the only such mutilation of our State Forests by the Marcellus Shale gas industry. The destruction is everywhere the public's land has been leased. And the destruction has the potential to grow five-fold, just with the 700,000 acres of State Forest that are already under lease. Really, could this mountain ever be restored? Could five times the desecration of this mountain ever be restored? What is the future of our treasured and irreplaceable public lands? Article I Section 27 of our State Constitution has meaning, whether the governor is responsible as trustee of our State Forests and Parks (the public trust), whether the governor or any governmental entity can convert these lands for the purpose of obtaining money, and more. The Respondents' brief is due July 22. For a synopsis of PEDF's Appeal, please click on the Current Litigation Tab. Portion of Loyalsock State Forest north of Trout Run, as yet untouched. and continue to be critical to the success of our case. But we still need your help to see it through. Free parking in the Market Street Garage. If you go to the Tiadaghton State Forest this spring, remember to do your fueling elsewhere. 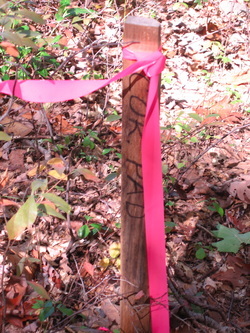 Former DCNR "Environmentally Sensitive Area -- Hiking Only," now site of pipeline crossing. (and leave it all up to the Supreme Court)? PEDF attorney John Childe has prepared an Analysis of the January 7, 2015 Commonwealth Court Opinion in PEDF's case, which resulted in PEDF's Appeal (see below) to Pennsylvania's Supreme Court. To read the Analysis, please go to Current Litig﻿ation tab. ﻿Now more than ever, we need your support! PEDF is a 501(c)(3), and your contributions are fully tax deductible as allowed by law. Tiadaghton, BEWARE in the people's "forest"
In a historic action to ascertain whether or not Article I § 27 has meaning, or if there is, indeed, a Public Trust as guaranteed in Pennsylvania's Constitution, PEDF attorney John Childe has filed an Appeal to the Supreme Court, with PEDF's claims described in the accompanying Jurisdictional Statement. For the text of the Jurisdictional Statement, please click on the blue wording or go to the Current Litigation tab. Tiadaghton, KEEP OUT of the people's "forest"
With its January 7, 2015 Opinion and subsequent denial of our Application for Reargument, the Commonwealth Court denied or dismissed PEDF's claims, clearing the way for the Supreme Court to clearly affirm the people's rights. Meanwhile, in his January 29, 2015 Executive Order 2015-03, Governor Tom Wolf states: "WHEREAS, the Department of Conservation and Natural Resources (DCNR) has a duty pursuant to the Conservation and Natural Resources Act (Act of June 28, 1995, P.L. 89, No. 18) (CNRA) to conserve and maintain State Forests and State Parks in the public trust for the use and benefit of all its citizens, and generations yet to come, as guaranteed by Section 27 of Article I of the Constitution of Pennsylvania . . ."
ASSOCIATED PRESS: January 30, 2015, "New drilling leases on public lands banned"
Today, PEDF filed an Application For Reargument with the Commonwealth Court, requesting them to consider critical facts and law which PEDF believes the Court either overlooked or misapprehended in issuing its Opinion on January 7, 2015. It is PEDF's hope that members of the Court will consider our Application and hear argument on why the Court should reconsider its Opinion, based on the reasons set forth in the Application. It is still PEDF's intent to file an appeal with the Pennsylvania Supreme Court, but PEDF wants to give the Commonwealth Court a chance to correct the record of their Opinion before the appeal is filed. Please click on the blue links above to read the Application for Reargument and Opinion in entirety. To read just the text of the Application for Reargument, please click on the Current Litigation tab. PEDF is an all-volunteer organization. Our funds are allocated entirely to litigation. We must have the resources to see this lawsuit through, and we need your help! Please click here to help us Save Our State Forests and Parks! To our followers: The Opinion filed by Judge P. Kevin Brobson in PEDF's case is being thoroughly reviewed by PEDF attorney John Childe. An update will be posted on this website once that is completed. In the meantime, please see below three news articles and one editorial about the Opinion. Thanks to all, and please continue to follow us! Typical markers along the "Marcellus State Trail"
alo﻿n﻿g the "Marcellus State Trail." It's fairly easy to travel the "Marcellus State Trail." Just go to your favorite State Forest in Marcellus Shale country, and follow the abundant and colorful flagging and stakes. They show you where the forest is now, and where it won't be. They show you where quiet forestry roads, towering trees, spring seeps, and glades of mosses, wildflowers and ferns will give way to dirt highways, machinery, metal, emissions, noise, dust, pipelines, and tons upon endless tons of stone base. They show you where a once living and renewable forest, "common property of all the people . . . including generations yet to come . . ." will become a hard-packed, lifeless, industrial zone. They show you where you no longer will be able to go. Katie Colaneri and Susan Phillips of StateImpact Pennsylvania describe DRN's lawsuit here. Both PEDF's and DRN's lawsuits are largely based on Article I § 27 (Environmental Rights Amendment) of our State Constitution. PEDF's suit challenges the Governor's and Commonwealth's authority to lease State Forest and Park land (the Public Trust) and to use the proceeds for the General Fund. PEDF awaits the Commonwealth Court's decision in this case. Please click on Current Litigation Tab for more information. The Environmental Rights Amendment catapulted into the spotlight earlier this year when the Supreme Court upheld challenges to the State's Act 13 (new oil and gas law) in Robinson Township v. Commonwealth of Pennsylvania, a case in which the DRN figured prominently. PEDF attorney John Childe asserts that our Constitution clearly puts ownership of the State Forests and Parks with the people of Pennsylvania, not the Governor or General Assembly. Please go to Current Litigation Tab for a summary of the principles argued by PEDF attorney John Childe at the October 8, 2014 oral argument before seven judges of the Commonwealth Court. Please Help PEDF Save Our Remaining State Forests and Parks! PEDF thanks Susan Phillips (StateImpact Pennsylvania) and Laura Legere (Post-Gazette) for the following news articles. 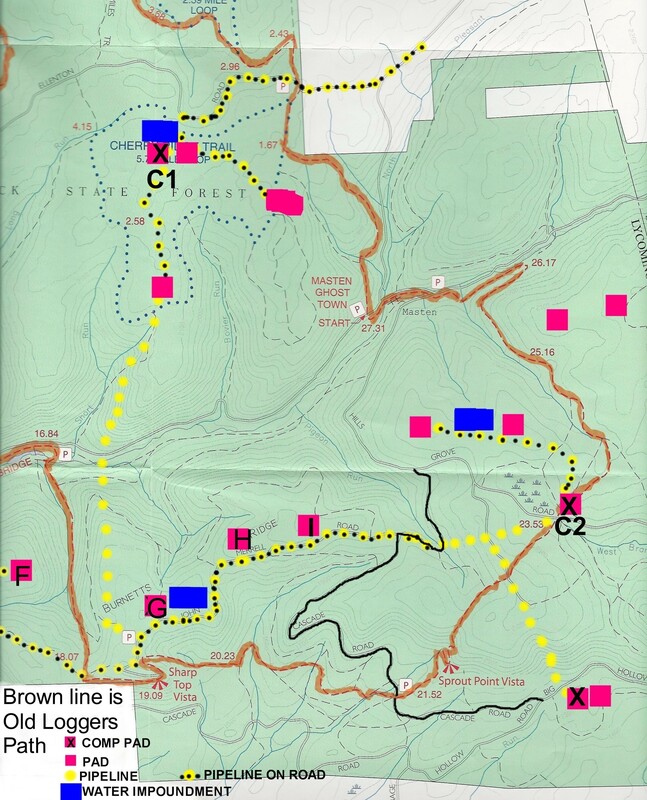 Terraced Sugar Camp Mountain Road and Seneca pad with 10 wells, Loyalsock State Forest. This mountainside has been bulldozed into the valley. PEDF Goes to Court October 8! Please see below. Final Brief Filed in PEDF's Case! PEDF attorney John Childe has filed the final Brief in PEDF's lawsuit to Save Our State Forests and Parks! from the harmful impacts of Marcellus Shale gas extraction. For a synopsis of the 76-page Brief, or to read it in its entirety, please click on ﻿Current Litigation﻿. Time: Arguments are set to begin at 9:30 a.m., but PEDF may not be scheduled first. Any changes will be posted at the top of this Home Page. Please Help PEDF Sa﻿ve Our Remaining State Forests and Parks! Click here. In this StateImpact Pennsylvania video, Marie Cusick reports on the public impacts of gas companies taking control of our public roads and lands. PEDF's lawsuit featured! To watch video, click here. New Order Issued in PEDF's Lawsuit! Governor Corbett will not lease any more State Forest or Park land until Commonwealth Court decides the merits of PEDF's case. Click on Current Litigation Tab for more information. Please help us Save Our State Forests and Parks! of the Tiadaghton State Forest that was presented at the hearing. Please help us Save Our State Forests and Parks! Click here. May 29, 2014: Read the news from the final two days of hearing! The photo album mentioned in the second article has been reproduced in the Photo Gallery. Please click here. Date and Time: Monday, June 2, 2014, 1:00 pm. For more information on this hearing and supporting documents, please go to Current Litigation Tab. May 29, 2014: Read all the news from yesterday's hearing! the forest that belongs to us all??? You can still get to this vista if you . . .
3) navigate AROUND the pad by scrambling over stumps, rocks and mounds of dirt, through brambles, and past Danger! signs to the treasured "public" view that was once open to all. Please help us take them back! PEDF Goes to Hearing in Commonwealth Court! ﻿*﻿ May 28, 2014: PEDF will present testimony in a hearing before Commonwealth Court. The above quote is from an article by Seamus McGraw on the Supreme Court's Act 13 Decision. To read the entire article, please click here. McGraw is the author of End of Country. Road to Ramsey Vistas. Hiking shoes required. With a new Executive Order, Governor Corbett has lifted former Governor Rendell's moratorium on the further leasing of State Forest and Park land. While the Order states that there will be no surface disturbance of these lands, this Order is a foot in the door. Governor Corbett's track record regarding the misappropriation of Oil & Gas Lease Funds speaks clearly. Impacts do not stop at the boundary lines. As we reported in a previous article, DCNR's April 2014 Shale-Gas Monitoring Report is "spin," and this new Order has all the makings of the same. and the impacts of these leases known and restored. * PEDF Attorney John Childe Files Final Documents in Lawsuit to Save Our State Forests and Parks! * Respondents to Lawsuit (Commonwealth of Pennsylvania and Governor Corbett) File Request for Six-Month Stay to Respond. * Commonwealth Court Orders Respondents to Respond in one week, by May 6, 2014. Please go to Current Litigation Tab for more information. Please help save our State Forests and Parks! Click here. * PEDF Wins Round 5 in Commonwealth Court! In February 2014, the Commonwealth Court granted PEDF's motion to withdraw all interventio﻿n authority of the Republican Caucuses in our lawsuit. To read more about the Caucuses' intervention, please scroll down to "PEDF Serv﻿es Notice of Intent to Sue to Republican Caucuses!" To read the Addendum, click here. For a summary, go to Current Litigation. Will mountaintop wetlands such as the one above and many other irreplaceable habitats continue to be destroyed? And will it be legal to do so? PEDF attorney John Childe has hand delivered to each member of the General Assembly a letter stating that passage of HB 1576 and SB 1047 will violate the General Assembly's constitutional mandate to conserve and maintain our natural environment under Article 1 Section 27. To read the letter, click here. To read Representative Robert Godshall's response, click here. ﻿What will the Old Loggers Path, the headwaters of Rock Run and Pleasant Stream, and much of the Loyalsock State Forest look like if Anadarko's plans for the Clarence Moore Tract are given approval? Anadarko's planned facilities have been projected onto two maps of the OLP. Click here for the West Section, and here for the East Section. PEDF's lawsuit is critical in winning back the lawful use of Oil & Gas Lease Funds to protect State lands such as these! PEDF's lawsuit is the ONLY litigation addressing the overall abuse of the people's rights to our State lands! PLEASE HELP! Click here. * Thank You, John Quigley! Former Pennsylvania DCNR Secretary John Quigley recently posted a blog, "Burning the Furniture to Heat the House - Again." This is a must read, and not only for his open endorsement of PEDF's lawsuit as "courageous pending legislation"! Keeping in touch with you, our members, friends, and supporters, is paramount for us, so we have created an e-newsletter that will be published on a periodic basis as we have news to report. January 20, 2014 is our first issue, and yes, it is FREE! Click here to subscribe. Following are the headlines. Please click on Current Litigation for the details. State Forest, Pine Creek, an increasing sign of the times. Please help PEDF put an end to this senseless destruction of our public lands, your irreplaceable lands! Click here to help. December 19, 2013. In a huge victory for the people of Pennsylvania and their commonly-held wealth of natural resources, the State Supreme Court ruled significant aspects of Act 13 unconstitutional, and upheld Article I § 27, Public Trust Doctrine. To read the Court’s Decision in its entirety, click here. For more information regarding the importance to PEDF's lawsuit, read on! Despite the landmark Supreme Court ruling, treasured views like this one looking down into the Pine Creek Valley from Manor Fork Road continue to be at risk from Marcellus Shale gas industry development. 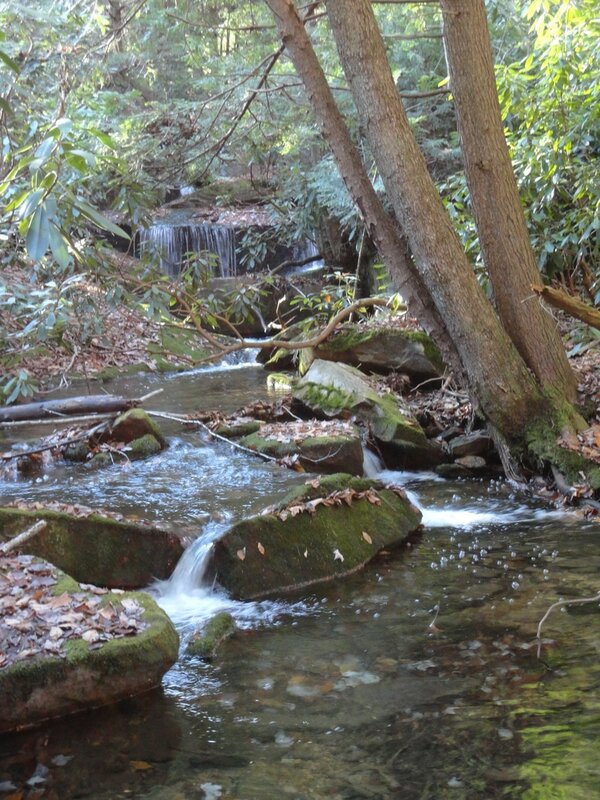 PEDF’s lawsuit holds the key to assuring that lands like these will remain forever wild. In the Decision, Chief Justice Castille wrote, “As the citizens illustrate, development of the natural gas industry in the Commonwealth unquestionably has and will have a lasting, and undeniably detrimental, impact on the quality of these core aspects (life, health, and liberty: surface and ground water, ambient air, etc.) of Pennsylvania’s environment, which are part of the public trust.” Opinion at 117. Chief Justice Castile went on to state, “By any responsible account, the exploitation of the Marcellus Shale Formation will produce a detrimental effect on the environment, on the people, their children, and future generations, and potentially on the public purse, perhaps rivaling the environmental effect of coal extraction.” Opinion at 118. What Does This Mean for PEDF’s Lawsuit? According to John Childe, PEDF’s attorney, the Act 13 litigation mirrors PEDF’s lawsuit in many ways, and the Supreme Court, in its Decision, vindicates most of PEDF’s arguments. PEDF’s lawsuit remains active and critical in the fight to save Pennsylvania’s State Forests and Parks from the harmful and irreparable impacts of gas industry development. But the Supreme Court’s Decision brings us closer to another victory. Thank you for the help you have given us! We need your continued support now more than ever. Save Our State Forests and Parks! "Second Amended Petition for Review in the Nature of an Action for Declaratory Relief"
Please click on Current Litigation for more information! PEDF Serves Notice of Intent to Sue to Republican Caucuses! * * * September 25, 2013, PEDF attorney John Childe served Notice of Intent to Sue Intervenors Republican Caucuses regarding HB 1681 sponsored by Representative Saccone. This proposed legislation would lease an additional 300,000 acres of State Forest land for the purpose of bridge repair work in Pennsylvania. Read the Notice here. If passed, this would violate an Executive Order, the Conservation and Natural Resources Act of 1995, the Oil and Gas Lease Fund Act, and Article 1 Section 27 of Pennsylvania's Constitution. In June 2013, the House and Senate Republican Caucuses filed a Petition to intervene in PEDF's lawsuit. Their attempt was twice denied by the Commonwealth Court, see Lawsuit Updates below. PEDF Serves Subpoenas to Three Former State Officials! * * * PEDF attorney John Childe has served subpoenas issued by the Commonwealth Court to former Pennsylvania governor Ed Rendell, former secretary of the Department of Conservation & Natural Resources (DCNR) Michael DeBerardinis, and former deputy secretary of DCNR James Grace. They are scheduled to appear in mid October to testify in depositions on behalf of PEDF. * * * Discovery Process: PEDF's lawsuit is now entering the "discovery process," which includes the writing of interrogatories, and the production of documents and notices of depositions. During this time, knowledge and information will be exchanged between parties, and potential witnesses for trial will be identified. And this is why . . . your help is needed now more than ever! We MUST have the funds to see this through! See SOS Forests & Parks! tab -- Please Help! Lawsuit Updates: Two More Wins for PEDF! * * * August 20, 2013 -- the Commonwealth Court issued its Opinion on the Republican Caucuses' Intervention in PEDF’s lawsuit and DENIED the Caucuses the right to intervene in the portions of the case dealing with Article I Section 27 of Pennsylvania’s Constitution, Public Trust Doctrine. This good news means the Court is listening to PEDF’s arguments. This good news means the Republican Caucuses cannot participate in the discovery and other mechanics of developing the case on the meaning of the Public Trust provisions. However, the Court allowed them to intervene on the 1st and 6th Counts, dealing with Article III, Sections 3 and 11, and they can file an Amicus Brief on the issues. * * * August 30, 2013 -- PEDF's attorney John Childe filed the First Set of Interrogatories to the Republican Caucuses. Read the Interrogatories here. Application for Reconsideration (see September 7 above). The Commonwealth Court has now determined twice that the Caucuses have no right to Intervene in the Article I Section 27 part of PEDF's lawsuit. from Further Surface Gas Impact! PEDF's attorney John Childe was recently quoted in three news sources regarding PEDF's lawsuit against Governor Corbett and the Commonwealth over the illegal transfer of Oil and Gas Lease Fund money from DCNR to the General Budget. PEDF contends this transfer violates Article 1 Section 27 of Pennsylvania's Constitution. To read the articles, click on the links below. * * * July 2, 2013, PEDF FILED OBJECTIONS! Read here. The people have a right . . .
What will it be like, if/when all is changed? 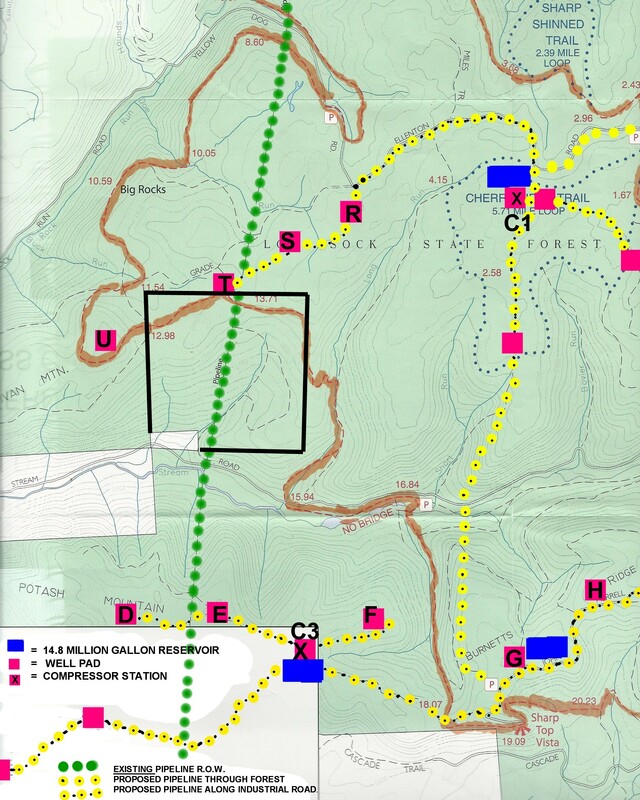 At the June 3, 2013 DCNR Public Meeting, Anadarko revealed plans, in the Clarence Moore Tract alone of the Loyalsock State Forest, for 26 well pads, 4 compressor stations, 5 earthen impoundments, 15.6 NEW miles of roads, 15.5 miles of rebuilt roads, 34 miles of NEW pipeline right of way, and a communication system with poles and towers 60 - 200 feet tall. Thank you to Anadarko for the honest facts. The Loyalsock is just ONE Pennsylvania State Forest. Across the Commonwealth, hundreds of thousands of acres of Forest are at risk from gas industry development, to be altered forever. These Public Trust lands are the guaranteed legacy of the Pennsylvania State Constitution, and IT MUST BE UPHELD! PLEASE HELP to uphold these lands, your lands. Click here. According to the gas company who developed this site, this is an example of an "environmentally responsible" operation. If this is true, kudos to the gas company. 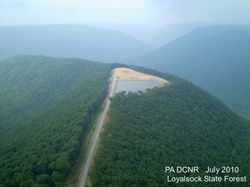 However, what is happening to the Loyalsock State Forest (and ALL of our State Forests in the Marcellus Shale region) that the governor and the Commonwealth of Pennsylvania are legislatively required to protect? Click Please Help! under SOS State Forests & Parks! tab. June 13, 2013, the Republican Caucuses for both the House and the Senate petitioned the Commonwealth Court to intervene in the action brought by PEDF against Governor Corbett and aimed at protecting Pennsylvania's public lands and natural resources. The Caucuses' Petition joins Governor Corbett in saying that Pennsylvania's Constitution doesn't matter, that the Public Trust (Article 1 Section 27) doesn't matter, and that the governor's and General Assembly's duties to preserve the Public Trust don't matter when there is natural gas to be extracted from public land. They furthermore argue that the funds from leasing these lands can and should be used for whatever use the governor and General Assembly deem appropriate, regardless of State law to the contrary. PEDF disagrees. Please see attorney John Childe's News Release, attached. Please see the Republican Caucuses' Petition, attached. Please help get the word out to everyone you know. ALL of our State lands are at risk! PLEASE HELP IN EVERY WAY YOU CAN! Go to PLEASE HELP! The mission of the Pennsylvania Environmental Defense Foundation is to aid, assist and educate the people of Pennsylvania by advocating for and enforcing their rights to a clean environment. Where environmental laws grant citizens the right to enforce the law by means of litigation, the Foundation will help individuals and environmental organizations exercise the citizen's provisions of the law. The Foundation was established in 1986 as a Pennsylvania nonprofit corporation. It is registered both with the Pennsylvania Department of State as a charitable organization and with the Internal Revenue Service as a tax-exempt organization under IRS Code 501(c)(3).